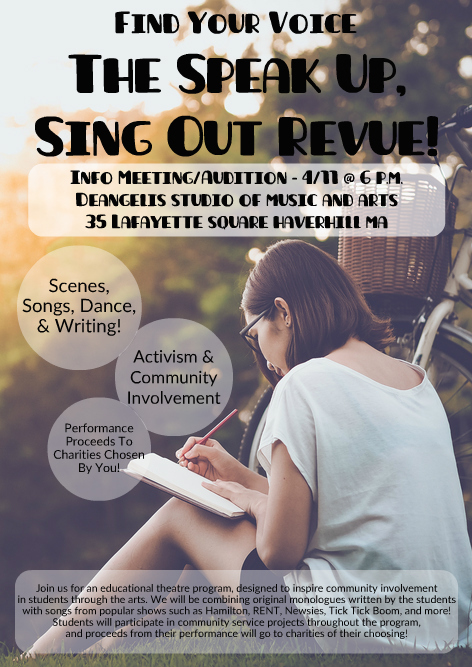 Auditions/Information Meeting – 4/11 @ 6 p.m.
Join us this spring for an amazing chance for children and teenagers to find their voices in the community and support causes they are passionate about through the arts! -Original monologues written by students about topics they are passionate about! -Songs and scenes from popular musicals such as Hamilton, Tick Tick Boom, Matilda, Newsies, RENT, Children of Eden, Into the Woods, Wicked, and more! -Community service projects for students to take part in to become involved in the area! -Proceeds from the performance will also go towards charities chosen by the students! We would love to have your voice! Rehearsals Saturdays from 2-5 p.m. Performance – 5/25 @ 5 p.m.